To help class members feel the love of the Lord Jesus Christ and develop a greater desire to exercise faith in Him and bear testimony of Him. Benson, Ezra Taft. "The Savior's Visit to America." General Conference Address April 1987. 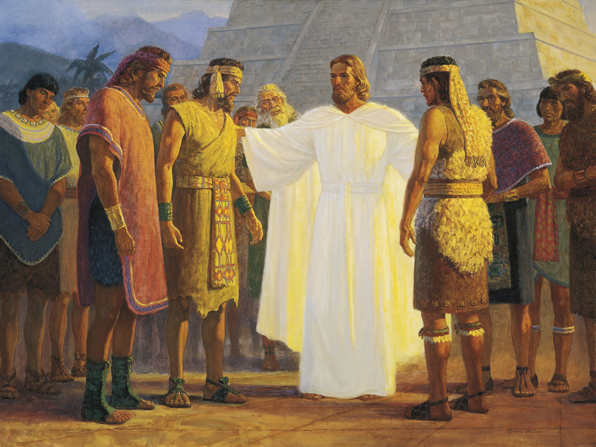 A conference address from President Ezra Taft Benson on Christ's ministry among the Nephites in 3 Nephi. Bokovoy, David E., and John A. Tvedtnes. "Christ in the Old Testament and the Book of Mormon." 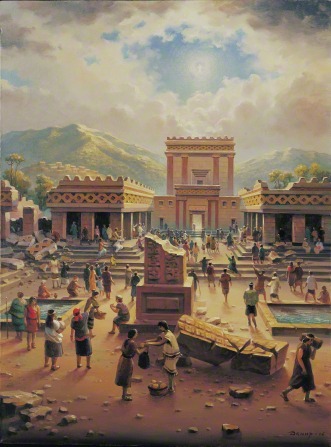 In Testaments: Links between the Book of Mormon and the Hebrew Bible, 7-23. Toelle, UT: Heritage Press, 2003. Holland, Jeffrey R.. Atonement of Jesus Christ In Encyclopedia of Mormonism, Edited by Daniel H. Ludlow. Vol. 1. New York: Macmillan, 1992. 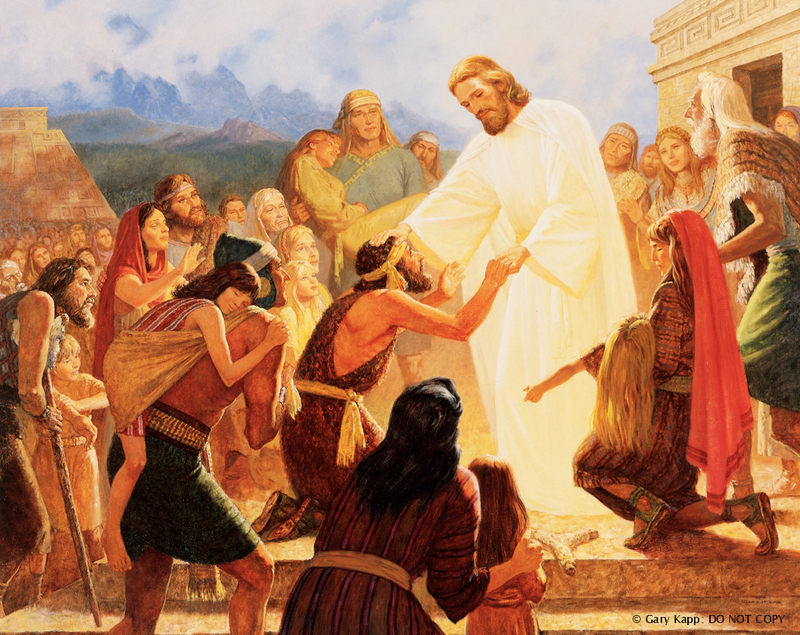 This article discusses all the cases where Christ made covenants with his people in the Book of Mormon. Of note is the instance in 3 Nephi, when Christ visites the Nephites in the Americas and puts away the Law of Moses for a new covenant. Matthews, Robert J.. "Jesus the Savior in 3 Nephi." In The Book of Mormon: 3 Nephi 9-30, This is My Gospel, edited by Monte S. Nyman and Charles D. Tate, Jr., 25-39. Provo, UT: Religious Studies Center, 1993. Millet, Robert L., Gary Lee Walker, Jerry C. Giles, Gerald Hansen, Jr., Andrew C. Skinner, Philip J. Schaelling, Daniel C. Peterson, Merril C. Oaks, Tad R. Callister, John Gee et al. Jesus Christ In Encyclopedia of Mormonism, Edited by Daniel H. Ludlow. Vol. 2. New York: Macmillan, 1992. 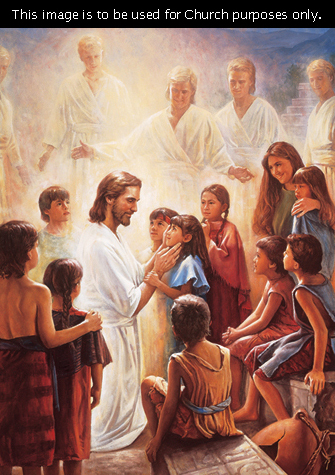 Encyclopedic entry on Jesus Christ, as he is understood in Mormon theology. 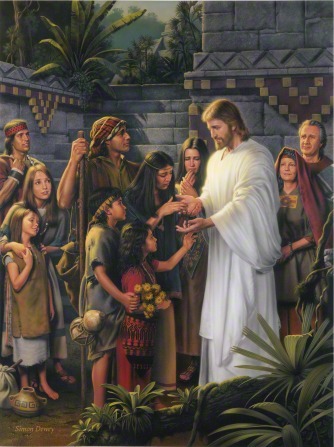 Jesus Christ plays a central role in the Book of Mormon, especially when he appears to the Nephites in 3 Nephi. Nelson, Russell M.. "Jesus the Christ - Our Master and More." In A Book of Mormon Treasury: Gospel Insights from General Authorities and Religious Educators, 19-31. Provo, UT: Religious Studies Center, 2003. Seely, David R.. Jehovah, Jesus Christ In Encyclopedia of Mormonism, Edited by Daniel H. Ludlow. Vol. 2. New York: Macmillan, 1992. An Encycopedic entry emphasizing the messianic role of Jesus Christ in Mormonism. Jesus Christ is the Jehovah and God of the Old Testament and was prophesied to come down to earth to redeem his people. Tanner, N. Eldon. "Christ in America," Ensign. May 1975. A Conference address from the First Counselor in the First Presidency on Christ in America. Starting with Biblical prophecies of Christ, President Tanner tells the story of Christ's appearance, expounding on the doctrines Christ layed out to the Nephites. Turner, Rodney. "Christ's Church in America." Ensign. March 2000. 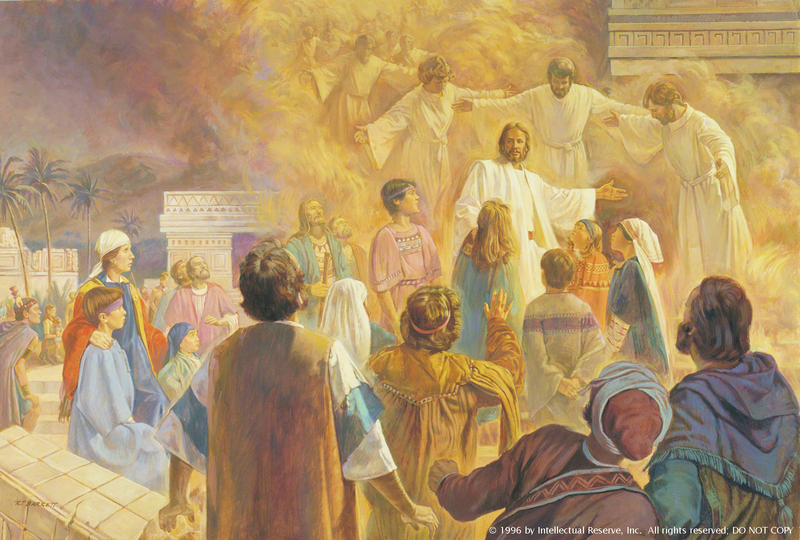 The Church of Jesus Christ experienced three phases in Book of Mormon times: the Old Testament-era Church among the early Nephites, the revitalization of the Church in Alma’s time, and the Church organized by the risen Lord. Welch. John W. "Seeing Third Nephi as the Holy of Holies of the Book of Mormon." Journal of the Book of Mormon and Restoration Scripture 19, no. 1 (2010): 36-55. 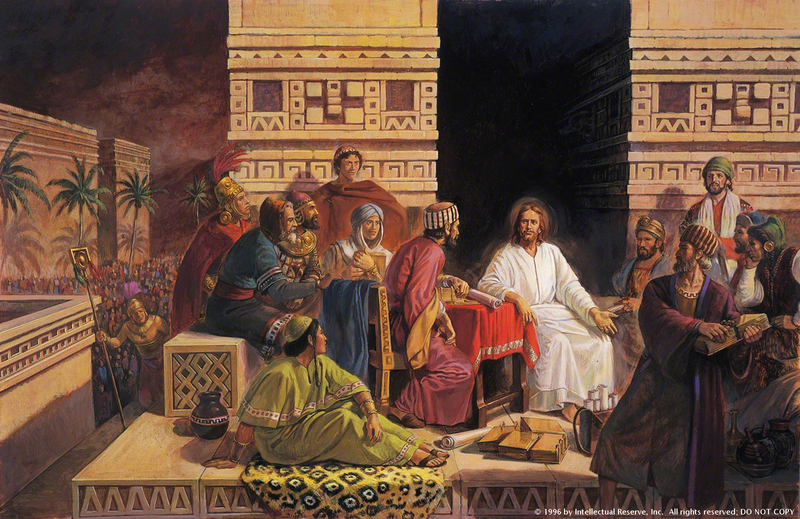 Halverson, Taylor, "3 Nephi 17-19: Christ's Visit to the Americas." Interpreter Resources for Students and Teachers October 9, 2016. Bednar, David A. "One By One." Music from the New Era July 2016. A new hymn with lyrics written by David A. Bednar on Christ's individual ministry to the Nephites in America. Bowen, Matthew L. "'They Came Forth and Fell Down and Partook of the Fruit of the Tree': Proskynesis in 3 Nephi 11: 12–19 and 17: 9–10 and Its Significance." In Third Nephi: An Incomparable Scripture. eds. Andrew C. Skinner and Gaye Strathearn. Provo, UT: Deseret Book, Neal A. Maxwell Institute for Religious Scholarship, 2012. Holzapfel, Richard A. "One By One: The Fifth Gospel's Model of Service." In A Book of Mormon Treasury: Gospel Insights from General Authorities and Religious Educators. Provo, UT: Religious Studies Center, Brigham Young University, 2003. Millet, Robert L. "The Praying Savior: Insights from the Gospel of 3 Nephi." In Third Nephi: An Incomparable Scripture. Eds. Andrew C. Skinner and Gaye Strathearn. Provo, UT: Deseret Book, Neal A. Maxwell Institute for Religious Scholarship, 2012. A piece of music which tells of the little children present when Christ came to America, and how Christ ministered unto them. 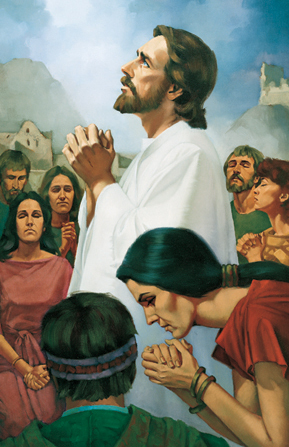 Parry, Donald W. “‘Pray Always’: Learning to Pray as Jesus Prayed.” In The Book of Mormon: 3 Nephi 9–30, This Is My Gospel. Provo, UT: Religious Studies Center, Brigham Young University, 1993, 137. Parry, Donald W. "'After This Manner...Pray Ye'" Ensign. January 1996. In ten chapters of 3 Nephi, the Savior gives remarkable teachings on prayer that can shape our entire lives. Rasband, Ronald A. "One by One." Ensign. November 2000. A General Conference Address, talking about how we need to reach out to the one, just as Jesus Christ reached out to individuals in 3 Nephi. A reference work on the variants in the various editions of the Book of Mormon. Swift, Charles. "'So Great and Marvelous Things': The Literary Portrait of Jesus as Divine Lord in 3 Nephi." In Third Nephi: An Incomparable Scripture. eds. Andrew C. Skinner and Gaye Strathearn. Provo, UT: Deseret Book, Neal A. Maxwell Institute for Religious Scholarship, 2012. Anderson, Kenneth W.. "The Twelve: A Light unto This People." In The Book of Mormon: 3 Nephi 9-30, This is My Gospel, edited by Monte S. Nyman and Charles D. Tate, Jr., 149-158. Provo, UT: Religious Studies Center, 1993. From those present at his appearance in Bountiful, Christ chose twelve disciples, who were also apostles, to lead hisChurch as he had done in the Holy Land. These men would be responsible for proclaiming the gospelamong their people and for judging all of Israel. Anderson, Richard Lloyd. "Religious Validity: The Sacrament Covenant in Third Nephi." In By Study and Also By Faith: Essays in Honor of Hugh W. Nibley. Vol. 2. Provo, UT: Deseret Book and FARMS, 1990. Bowen, Matthew L. "'In the Mount of the Lord it Shall Be Seen' and 'Provided': Theophany and Sacrifice as the Etiological Foundation of the Temple in Israelite and Latter-day Saint Tradition." Interpreter: A Journal of Mormon Scripture 5 (2013): 203-223. Lambert, Neal E.. "The Symbolic Unity of Christ's Ministry in 3 Nephi." In The Book of Mormon: 3 Nephi 9-30, This is My Gospel, edited by Monte S. Nyman and Charles D. Tate, Jr., 195-209. Provo, UT: Religious Studies Center, 1993. McConkie, Joseph Fielding. "The Doctrine of a Covenant People." In The Book of Mormon: 3 Nephi 9-30, This is My Gospel, edited by Monte S. Nyman and Charles D. Tate, Jr., 159-181. Provo, UT: Religious Studies Center, 1993. Sweat, Anthony. "Active Learning and the Savior's Nephite Ministry." Religious Educator: Perspectives on the Restored Gospel 10, no. 3 (2009): 75-86. Welch, John W.. "Our Nephite Sacrament Prayers." In Reexploring the Book of Mormon, edited by John W. Welch, 286-289. Provo, UT: FARMS, 1992. The sacrament prayers used today in the church can be found in the Doctrine and Covenants, but their predecesors are found in 3 Nephi 18. While there are slight differences in the prayers found in Mosiah 5, 3 Nephi 18, and Mormon 4-5, all testify of the atonement of Jesus Christ. Welch, John W. "Reusages of the Words of Christ." Journal of Book of Mormon Studies 22, no. 1 (2013): 62-72. This is an excerpt from and summary of an article by John W. Welch that appeared as “Echoes from the Sermon on the Mount,” in The Sermon on the Mount in Latter-day Scripture. Gee, John, John A. Tvedtnes, and Matthew Roper, "Book of Mormon Names Attested in Ancient Hebrew Inscriptions." Journal of Book of Mormon Studies 9, no. 1 (2000): 40-51, 78-79. 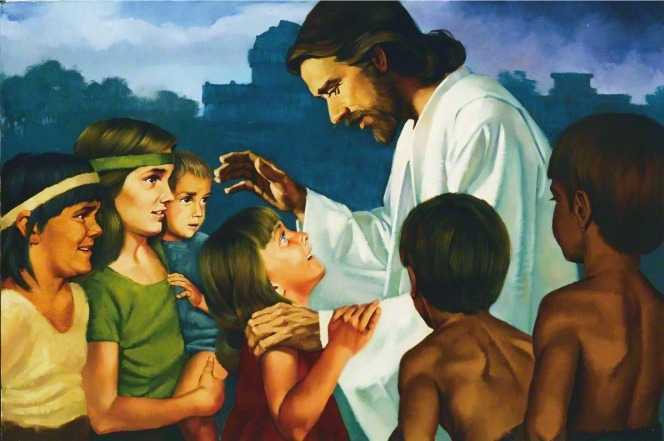 Mathoni and Mathonihah were the names of two of the twelve disciples chosen by Christ during his visit to the Nephites, and this article shows that these names can be attested in the Bible. Hansen, Jr., Gerald. "Gathering to the Temple: Teachings of the Second Day." In The Book of Mormon: 3 Nephi 9-30, This is My Gospel, edited by Monte S. Nyman and Charles D. Tate, Jr., 211-223. Provo, UT: Religious Studies Center, 1993. Nyman, Monte S.. "The Designations Jesus Gives Himself in 3 Nephi." In The Book of Mormon: 3 Nephi 9-30, This is My Gospel, edited by Monte S. Nyman and Charles D. Tate, Jr., 41-58. Provo, UT: Religious Studies Center, 1993. Ricks, Stephen D. "I Have a Question." Ensign October 1992. The name of one of the Lord’s disciples listed in 3 Nephi 19:4—Timothy—seems to be Greek in origin. It may be that the name Timothy, as well as other manifestations of Greek influence, was brought to the New World by the Mulekites. Spackman, Beth T. "I Have a Question." Ensign. June 1988. 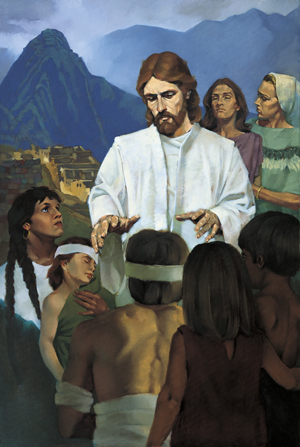 In 3 Nephi 19:16–30, we read that, when Jesus was in their immediate presence, his disciples prayed directly to him. Apparently, on that occasion, while he was in their presence, praying to him was acceptable. After he left them, however, the Nephites continued the pattern of praying to the Father in Jesus’ name, as we are directed to do also. Welch, John W. "The Lord's Prayers." Ensign. January 1976. Welch emphasizes the importance of learning from the prayers of Jesus Christ found in scripture. There are few instances, but each one fills our lives with richer meaning. As part of this discussion, Welch draws on the Lord's Prayer and Christ's prayer on behalf of the Nephites in 3 Nephi.